Quite a few friends and family members of mine are loving Google’s new GBoard third party keyboard for iOS. I am currently on Android and Google has not released GBoard for Android. So unlike most feature fridays, I am not going to be able to explain why I like this feature so much. I expect there are plenty of AVC community members who can do that in the comments. At USV, we have looked closely at the third party keyboard market. It’s a big opportunity to get in between a user and the two dominant mobile operating systems. There could be a lot of value in doing that. But we ultimately determined that the mobile keyboard market was likely to be dominated by Apple and Google for a bunch of reasons. The emergence of GBoard only reinforces that view in our office. But you can understand the strategic importance of Google gaining market share in the iOS keyboard market. Every key that is typed on a mobile phone is information for Google’s machine learning algorithms. So getting prime real estate on iOS is super strategic. It is also a smart way to defend their search franchise on mobile. It sounds to me that Google has delivered a fantastic third party keyboard for iOS. If you have used or are using GBoard, I’m interested in your thoughts on it in the comments. I was in meeetings all day the past couple days and missed all the news coming out of Google’s big event. So I am getting my friends Bijan and Nabeel to explain it all to me. You can do that too by hitting the play button below. I hear this said all the time – “when you have concerns about an employee, it almost always means you will need to make a change.” I hear execs lament that they tend to wait too long to admit that they made a hiring mistake and act on it. I hear them wish they trusted their gut more. And it is not always a hiring mistake. It is often a case of someone doing great in a role or an organization at at time and then failing as the org or the culture changes around them. In this latter scenario, loyalty and appreciation for contributions made loom large. And yet that conflicts with the idea that you can grow and develop talent and you can coach people to evolve and change. A friend of mine told me yesterday that “you have to pay attention to the key moments” when you are evaluating an employee that you have questions about. She suggested that concerns always exist and it is not true that when you have concerns, it almost always leads to making a change. And she said that culture matters a lot and can’t be sacrificed when making these calls. I don’t do a lot of hiring and firing personally, only at the highest levels. But I do observe executives in our portfolio companies struggling with these decisions and have gone back and forth on how to advise them in these situations. I tend to like action, decisiveness, and a willingness to make a mistake over inaction, pondering, and a desire to get everything right. And so I generally coach executives to make a call and move on when they have concerns. But the conversation with my friend yesterday gave me pause. I wonder if my advice to make a call and move on is always the right advice. I am curious how the AVC community thinks about these things. Because these are the things that matter most of all in building, managing, and leading a business. I wrote a blog post a while back about collaborating on a list in Google Sheets. At USV, we do a lot of list making in Google Sheets. But Sheets doesn’t have a great conversational interface for coming up with new entries for the list. So we use email to do that but the process is clunky. In that post, I suggested that we might write a slack bot that takes a conversation in a slack channel and turns it into a list in Google Sheets. A few days later, I got an email from Alex Godin who had built exactly that bot. We tried it out at USV, made a bunch of suggestions on how to make it better, and the result is the “Yes And” Slack Bot. It was approved yesterday by Slack and is now in their app store. If you and/or your company uses Slack and Google Sheets a lot, you should give it a try. Details on how to do that are here. I love it when a blog post at AVC turns into something. It happens a lot actually. I’m still not feeling great. So I’m taking the day off and posting a video from Disrupt featuring my partner Andy, Josh Kopelman (one of my favorite VCs), and one of Josh’s limited partners Chris Douvos. They discuss the challenges of operating in an environment with rising valuations and decreasing liquidity. Since we came back from Los Angeles six weeks ago, I have been going harder than any time that I can remember. I’ve had many days when I start with a breakfast at 7am and end with a dinner that wraps at 11pm. Two weeks ago, I gave speeches at three evening events. Last week, I had dinner functions four nights in a row. My workout routine is in shambles and I am not getting enough sleep. I am posting less thoughtful stuff here at AVC. I am three weeks behind on email. Even the CEOs of our portfolio companies are not getting replies from me. That never happens and cannot happen. This weekend I got the notice from my body that I need to slow down. It always happens to me when I’m going too hard. I feel like I’ve got the flu even when I don’t. Some of this is because I put off a number of things when we were in LA and I’ve been trying to make them up now that I’m back in NYC. I’ve been doing a lot more meetings at USV, I’ve been doing a lot more fundraising for CS4All. I’ve been catching up with business relationships that I didn’t see when I was in LA. Some of this is because I’ve taken on a bunch of new projects without closing down any. I’ve done this a number of times in my career and it always bites me. I should say no to new things unless and until I can wrap up old things. But I have a bias to say yes and I sometimes break this rule. And then I pay the price. Finding balance is hard for me. I have tried blocking out slots in my schedule. And then I override them and use these slots to book last minute meetings that come up. I have tried working from home on fridays. And then I allow myself to get scheduled back to back to back on calls and videoconferences. I have tried to not work on weekends. But then the stuff I couldn’t get to during the week finds itself on my to do list on the weekends. I have tried to not do work stuff at night. And then I get talked into doing it. I am committing myself to getting things back in balance. I am going to get back on my workout routine. I am going to cancel a bunch of evening events. I am going to cut down or cut out public speaking. I am going to sleep longer and better. And I am going to start going to the beach where I always find and keep down time. I tell you all of this because writing it down publicly will help me commit to it. And because you may get a no from me when you ask to meet me or get me on a call. And because you might see less of me out and about, talking, speaking, being. My friend (and AVC community member) Kirk calls dieting “lockdown”. I am going on lockdown on work/life balance and I’m going to find more life and a bit less work. I need to. Ted Livingston, founder and CEO of our portfolio company Kik, did an interview last week at Disrupt in which he talked about the chat market, bots, and Kik’s role in all of that. I saw this projection from BI Intelligence below. 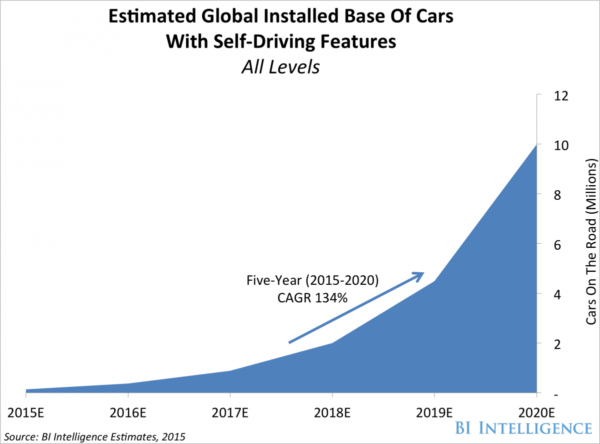 It suggests we will have 10mm self driving cars on the road by 2020. They define “self driving” as “as any car with features that allow it to accelerate, brake, and steer a car’s course with limited or no driver interaction”. The Telsa that my wife and I drive fits that definition. It is unclear to me whether this is a global number or not. I assume it is. There are over 1bn cars on the road around the world, so that would be 1% penetration. That seems low to me. Do you think “self driving” will have penetrated more than 1% of the world’s car population by the end of this decade? I do. One of Michael Bloomberg’s most important accomplishments as Mayor of NYC was taking control of the NYC school system. In the decade since he did that, NYC public schools have improved significantly including increased high school graduation and college readiness rates. The public school system remains a work in progress and there is much more to do. The system has improved but not nearly enough. So it concerns me greatly that politics in Albany are playing around with mayoral control of the schools. Mayoral control of the NYC public schools is set to expire on June 30th and there are signs that the Governor and state legislature are thinking about not renewing it. This would be a colossal mistake. Organizations require accountability to succeed. The Mayor must be able to hire and fire the school chancellor and drive the necessary changes in the system. We tried the other way for many years and it was a disaster. I urge the elected officials in Albany to come to their senses and renew Mayoral control, not just for another year, but for at least the next five years. Longer would be even better.